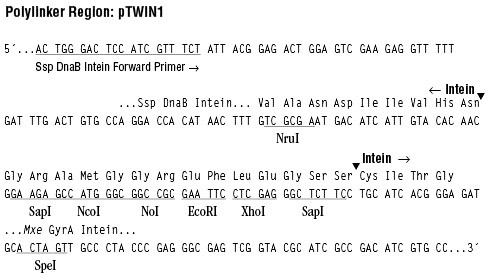 pTWIN1 is an E. coli expression vector designed for protein purification or for the isolation of proteins with an N-terminal cysteine and/or a C-terminal thioester. A polylinker in the vector is designed for the in-frame fusion of a target gene between the modified Ssp DnaB and Mxe GyrA inteins. The presence of the chitin binding domain from Bacillus circulans facilitates purification. pTWIN1 is an E. coli expression vector which can be used with the IMPACT™ Kit (NEB #E6901). pTWIN vectors are designed for protein purification or for the isolation of proteins with an N-terminal cysteine and/or a C-terminal thioester (1). A polylinker in the vector is designed for the in-frame fusion of a target gene between the modified Ssp DnaB (2) and Mxe GyrA inteins (3,4). The presence of the chitin binding domain from Bacillus circulans (5,6) facilitates purification. The double-stranded vector is 7,375 base pairs in length. Cell Lysis Buffer: 50 mM Tris-HCl (pH 8.5) containing 500 mM NaCl. Ssp DnaB Intein Cleavage Buffer: 50 mM Tris-HCl (pH 6.0) containing 500 mM NaCl. Mxe GyrA Intein Cleavage Buffer: 50 mM Tris-HCl (pH 8.5) containing 500 mM NaCl and 50 mM 2-mercaptoethanesulfonic acid. Evans, T.C., Benner, J. and Xu, M.-Q. (1999). The cyclization and polymerization of bacterially expressed proteins usingmodified self-splicing inteins. J. Biol. Chem.. 274, 18359-18363. Mathys, S., Evans, T.C., Chute, I.C., Wu, H., Chong, S., Benner, J., Liu, X.-Q. and Xu, M.-Q. (1999). Characterization of a self-splicing mini-intein and its conversion intoautocatalytic N- and C-terminal cleavage elements: facile production of proteinbuilding blocks for protein ligation. Gene. 231, 1-13. Evans, T.C., Benner, J. and Xu, M.-Q. (1998). Semisynthesis of cytotoxic proteins using a modified protein splicing element. Protein Sci.. 7, 2256-2264. Southworth, M.W., Amaya, K., Evans, J., T.C., Xu, M.-Q. and Perler, F.B. (1999). Purification of proteins fused to either the amino or carboxy terminus of the Mycobacterium xenopi gyrase A intein.. BioTechniques. 27, 110-120. Wu, H., Xu, M.-Q. and Liu, X.-Q. (1998). Protein trans-splicing and functional mini-inteins of a cyanobacterial DnaB intein. Biochem. Biophys. Acta. 1387, 422-432. Telenti, A., Southworth, M., Alcaide, F., Daugelat, S., Jacobs, W.R. Jr. and Perler, F.B. (1997). The Mycobacterium xenopi GyrA protein splicing element: Characterization of a minimal intein. J. Bacteriol.. 179, 6378-6382. Dubendorff, J.W. and Studier, F.W. (1991). Controlling basal expression in an inducible T7 expression system by blocking the target T7 promoter with lac repressor. J. Mol. Biol.. 219, J. Mol. Biol..
Notice to Buyer/User: The buyer/user had a non-exclusive license for Research Purposes Only. See RESEARCH USE ASSURANCE STATEMENT on neb.com.